(Family Features) During the cold winter months, a hearty, home-cooked meal is just the thing you need to warm up. After a long day, it can be tough to find time or energy to get dinner on the table – so take advantage of your slow cooker and let it do all of the work for you. A few minutes of morning prep time are all you need for a rich, satisfying dinner that’s ready to serve the moment you walk through the door. With the right ingredients, you can prepare a flavorful home-cooked meal that the whole family will love in less than 30 minutes. Pre-seasoned in a variety of delicious flavors, like Peppercorn & Garlic or Applewood Smoked Bacon, Smithfield Marinated Fresh Pork is the perfect base for any slow-cooked meal and makes prep time even easier. Whether cubed for a hearty stew or left whole to slice or shred, Marinated Fresh Pork offers endless and easy meal solutions, perfect for any night of the week. 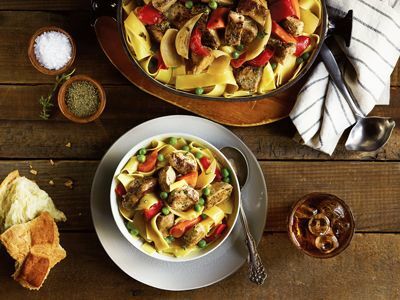 For a fresh twist on a traditional slow-cooker meal, try this Peppery Country Pork Stew. 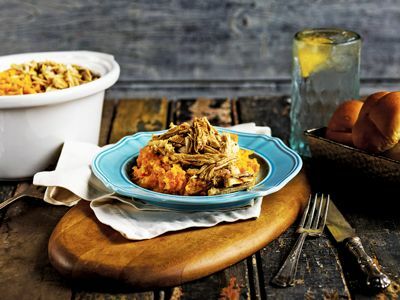 Or for a sweet and spicy option, try Slow-Cooked Pork with Soy and Smashed Sweet Potatoes. Find more quick and effortless meal solutions at Smithfield.com/RFRF. In small bowl, combine sugar, soy sauce and pepper flakes, cover and set aside. Coat 5-quart slow cooker with non-stick cooking spray. In slow cooker, combine potatoes and onion. Pour pineapple and its juice over top. Place pork loin filet on top and sprinkle with black pepper. Cover and cook on high for 4 hours (low: 8 hours). Remove pork and place on cutting board for 10 minutes. In slow cooker, add butter to potato mixture. Using potato masher or fork, mash until well blended. Slice or coarsely shred pork. Spoon potatoes onto serving platter then top with shredded pork. Stir soy sauce mixture and spoon over pork and potatoes. In large skillet, heat 1/2 tablespoon oil over medium-high heat. Working in two batches, brown pork, about 4 minutes each batch, turning occasionally. Add remaining 1/2 tablespoon oil for second batch. Meanwhile in 5-quart slow cooker, combine carrots, onions, peppers, 1/2 cup water, bouillon granules and thyme. Top with browned pork, cover and cook on high for 4 hours (low: 8 hours). Combine cornstarch and remaining water until dissolved; stir into pork mixture with peas. Cover and cook on high for 15 minutes to thicken slightly. Add salt, to taste. Serve pork stew in shallow bowls over egg noodles.